Well, what can I say, you’re only pregnant once, or twice, or four times, but at any rate, live it up, right?! I absolutely LOVE being pregnant at Halloween time. It gives me (and my husband) an opportunity to come up with fun ways to celebrate, not only the little life coming, but also that wonderful belly that just continues to grow, no matter how many sweets you intend to cut out. This year, as I was pondering what my husband and I could pair up and be, a close friend of mine mentioned why not be Mother Earth and Father Time? My belly was Earth-like, after all, and my husband is definitely getting up there at the ripe ol’ age of 35, so it seemed like the perfect fit. As I thought more about the costumes, I realized I didn’t know that much about either one of these characters, so I did an image search on the computer and came to find out that although Father Time was pretty much the same looking guy throughout most of the images, Mother Earth was depicted very differently. I decided instead of getting overwhelmed with the images that people had come up with, I would just throw together my own rendition of what she might look like, even though in the end, it did turn out a bit different than in my mind. 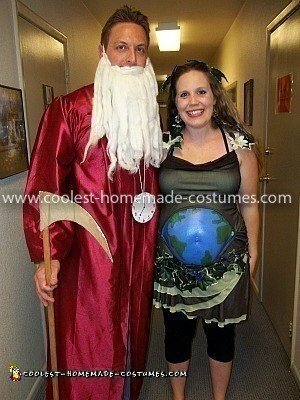 To make the Homemade Mother Earth and Father Time Pregnant Couple Costume, we simply shopped at the thrift store. We found a robe for Father Time for about two bucks and then found a cheap ($5) white beard and made a clock to hang around his neck out of cardboard and some yarn. We also made the scythe out of cardboard and aluminum foil and hot glued it to a wooden rake handle. All together the Father Time costume equaled about $8 and about no time in preparation. Pretty good, right?!! For Mother Earth, I found an earthy toned dress (green and brown) from the thrift store as well. I paid three dollars for it. I then bought some fake ivy from Wal-Mart for three dollars as well, and some fake glittery eyelashes and blue and green face paint (for the Earth) that equaled about six dollars. The idea was to put the dress on, draw a circle around my belly (where the Earth would pop through), hot-glue some ivy leaves and some little silk flowers I had on the dress and be done. What I didn’t take into consideration was the fabric of the dress. It was very stretchy and because of having that kind of material, when I made the circle mark, then cut it out, the circle became a huge oval because the majority of that middle material holding the dress together was gone. So… with that, I ended up having to stitch the dress around the edges of the circle I had cut out to get it to that round shape I needed. Because I am not a seamstress, that part took the longest and was most definitely frustrating. But in the end, it worked out well and when I was done with the sewing part, I just took different ivy leaves and little silk flowers and hot glued them to the dress. I chose to just make a large row of foliage around the bottom of the dress, front and back. I also glued them on the straps of the dress and then ended up pinning some in my hair for the finished product. I put the dress on first, then outlined the circle hole with some Kleenex so I wouldn’t get paint on the dress, then proceeded to paint my preggo belly blue, for the ocean. I then had a friend paint some of the continents on with the green. 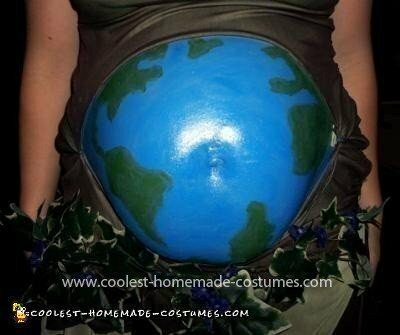 In the end, I had a beautiful Earth for a belly and a lovely, foliage covered dress for the rest of the costume. There was not a soul around that couldn’t guess what I dressed up as, which, for me, meant success! The entire costume ended up being about $10 with some definite time involved, but was absolutely worth it and a blast in the end!